This week's historic Unique Item is truly barking. It sold at Auctions Neapolitan's one-room-only sale, in January, for nearly four times its $8,000 estimate. The item in question is a 39inch wide carved tableau of a St Bernard dog and three playful pups, dated to circa-1900 and estimated at $6,000-8,000. The substantial 33 lbs artwork auctioned with a growl, eventually commanding a re-bark-able $30,590. Carved by artist Walter Mader, the piece inspired tremendous interest from bidders - a sizeable contingent of whom participated in the saleroom, and via phones and internet. In the end, the winning bidder was a major Black Forest art collector of some 30 years. He participated by phone from his home in Colorado, US. While the uninitiated could mistake this piece for a novelty item, it is in fact an incredibly rare and beautiful condition artwork - and a testament to the talents and eccentricities of its creator, Walter Mader. 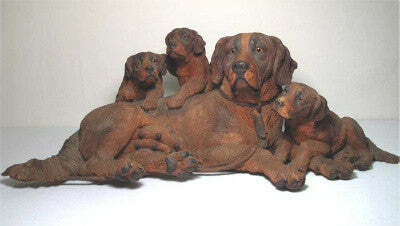 Mader's only subjects were his dogs and nothing else, as this unique and unmistakeable carving attests. According to Auctions Neapolitan's experts, the artist's idiosyncrasies can be seen in the dogs' facial expressions. What's more, a larger version of the tableau can be found in a museum in Brienz, Switzerland, once a major carving town. Two more are held in private collections, in Paris. Auctions Neapolitan is a Florida-based auction house which claims to source 98% of its lots from homes and estates in the Naples, Florida area, and the remaining 2% from dealers.